Gayatri Employ Solution ( Gayatri Solution Group ): Gujarat Rajya ma police Bharati mate nu Important notification ......! Gujarat Rajya ma police Bharati mate nu Important notification ......! Gujarat Home Department will be published Gujarat Police Recruitment 2014-2015 Notification Related Important Notice in Today sandesh News Paper. Gujarat Police Sub Inspector & Assistant Sub Inspector Recruitment Notification Advertisement will be published soon. 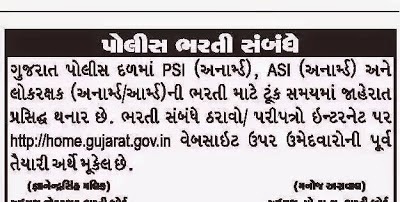 The Department declared Gujarat PSI & ASI Recruitment related Circular and Examination Rules at on official website home.gujarat.gov.in. Good Information about Gujarat Police Result 2017 available here. Check out your Gujarat Police Result 2017 here.